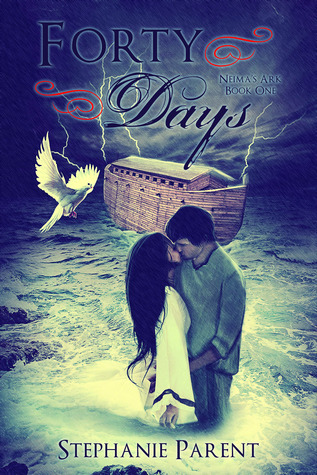 Welcome at another stop of the Forty Days Blog Tour!! Since I am not blindly doing any promo posts (as regular readers of this blog might have noticed), but am doing this anyway, I thought I should give you the why. Well, I'm personally not much for bible stuff and stories, so I decided not to read this and do a promo post instead, because I really liked Defy the Stars when I got it for the tour review. Thus, I thought it was okay to help the author promote another story, although it might not be my kind of thing. “Noah didn’t ask us to bring live fish on board,” Arisi points out, as though she can read my thoughts. Sometimes I suspect she really can. “How would we even…” I imagine Kenaan trying to capture all manner of fish in a bucket or barrel, claiming he’s found one male and one female of each type, and then scrambling to separate them by kind before the larger ones eat the smaller. Perhaps I’m just too exhausted and overwrought, but somehow the idea seems so ridiculous, I can’t stop myself from laughing out loud. And once I start laughing, I can’t seem to stop. My giggles must be contagious, for Arisi soon joins in, letting out great, desperate heaves of laughter that I worry will exhaust her. I assume she’s picturing a scene similar to the one in my own head. Even Aliye, unwilling to be left out, gives a few chuckle-like chirrups. “Dirt?” I laugh even harder. “…mmm, yes…” I’d give anything to smell solid ground right now. “…the rough, grainy feel of it between your hands…” Arisi rubs her fingers together almost greedily. My stomach sinks, the last of my laughter dying away all at once, as I realize Arisi’s not joking. She really does want to eat dirt—and salt. We could have brought salt onto the ark, if we’d only known, only thought ahead, and then perhaps Arisi wouldn’t be so sick and miserable now. If we’d only known, if we’d only thought ahead… So many things might be different. I haven't heard of this but its sounds really interesting 🙂 Is this a bible story retelling?! I've never read one before! I won a copy of this and can't wait to read it! Living on an arc would be crazy. Can't wait to see how it goes. I am curious about this one, and I do love the cover. Thanks for sharing the giveaway and the excerpt.